← Radish Scarf in Homespun Magazine! Celebrity Week at Michaels! And my new crochet class! 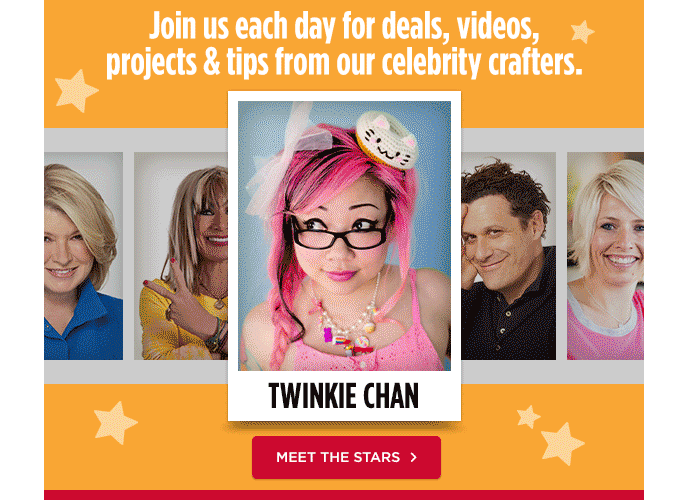 It’s Celebrity Week at Michaels Stores, and I was so super duper honored to be included in this party! Like, hello, this is as close to Betsey, Isaac, and Martha as I’ll ever get! (Actually, Betsey was appearing at her old store in LA one time, and we happened to be in town, but I was not feeling cute, and I think we’d been hoofing it around all day, so decided to pass!) If you click on the “Meet the Stars” page, most of us have little promo videos! All week, there will be craft tips, new products, and special sales at Michaels. I am promoting a new crochet class that will be taught exclusively at Michaels Stores starting in October and running through December. Please note, that I will not be personally teaching this class, but I wrote the pattern that certified instructors will be teaching you. 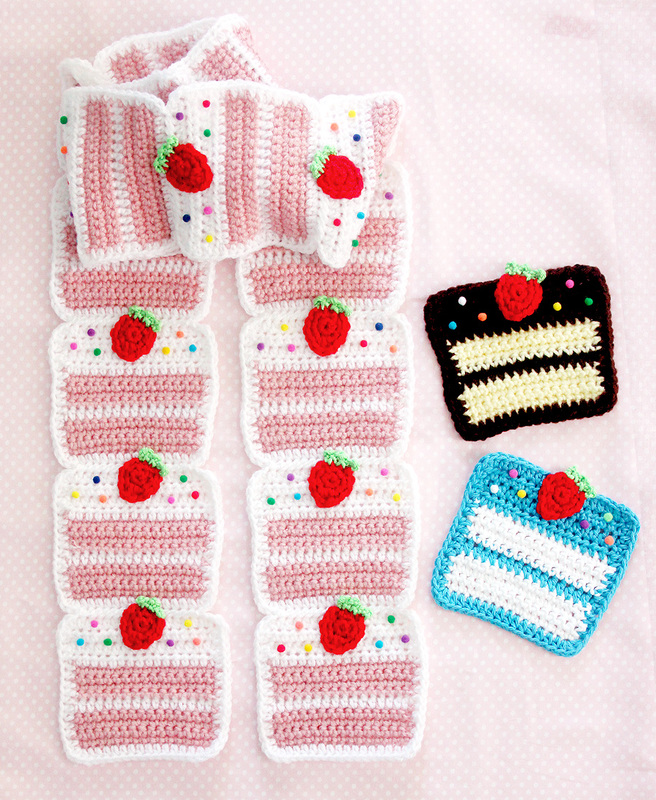 The project is a Strawberry Cake Scarf, and it’s also a really great pattern for beginners! I am not sure if they have plans to post the pattern online or not, so you should take the class if you want it, especially in time for the holidays! I linked the above banner to the link that is from the Michaels email newsletter, but it doesn’t link directly to my class in particular. Just click onto “Knit & Crochet” classes, and then click on the “Book Your Class Now” button. Enter your zipcode, click on a local store, and check out their class listings for October. My class does not show up at my closest store, so I’m curious if it’s scheduled yet anywhere else! Also, maybe something else will happen on “my” Celebrity Day, so let’s hold tight and see what happens! I’m assuming that will be next Saturday or Sunday! 33 Responses to Celebrity Week at Michaels! And my new crochet class! Thank you!!!! I hope people enjoy the class! Michaels Location and they ARE NOT Having your Class!! This is DEVASTATING!! Like REALLY!? (instead of a freebie) …?? I’m gunna be feeling SOOO Left out! HI! I sold the rights to my pattern to them, so it’s up to them how or if they release the pattern. I’m sorry about that! Maybe you request the class with the staff at your local store? Super congrats 🙂 The pattern is super cute too – they definitely need to expand out to Australia! Do you get to meet the other celebs? Congrats!! You’re totally a star. Aw, Kathryn, I appreciate it! I would love to make one! After much sleuthing on michaels.com, I finally found the class at my local store. Took a LOT Of digging! It’s offered the end of October and they don’t have anything listed for November yet. My gal at Michaels told me it’s all about the stores adding the class to their system if they have a yarn instructor, so hopefully they’ll start picking up on it! This scarf looks like little cake shaped washcloths sewn together. Adorable! It’s definitely a versatile pattern! I like the idea of making pockets out of them. Or even small purses/pouches! I can totally see that! A cake slice pocket on a picnic basket tote bag or something. Not on the schedule at my michaels either. I just signed up for the class on October 27. Im so excited,I cant wait! AHH so cool!!! You have to tell me how it goes!